I didn't make too many Christmas cards last year because I just didn't have the time. Well, now I do. So I figure I might as well get a jump on Christmas for this year! Here's one I made using the Theresa Collins December 25th cartridge that I ordered right after Christmas because I saw it on sale at Hallmark Scrapbooking! This is an A2 size card. I cut the Santa silhouette and circle at 3-1/4" from the December 25th cart. All paper is from my scraps. The Cuttlebug Victoria embossing folder was used on the white background mat. I typed the sentiment on my computer, cut and inked the edges of it, and added some red sparkly ribbon. Love how the background looks like swirly snow ... perfect for your Santa silhouette ... so glad you're starting 2013 with us at jingle belles. The Santa silhouette looks awesome! Love the embossing too! So glad you joined us in the challenge at LSP! This card is simply beautiful!! 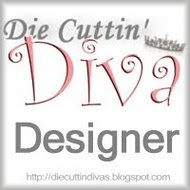 Love your silhouette card!Yes we should all plan ahead!Great idea! Somehow I missed this one. Love the layout of the card with Santa in the oval die cut. Loving those scallops around it. WOW...building your Christmas Card stash already?! Impressive! Thanks for playing with us this week at HIMCR!